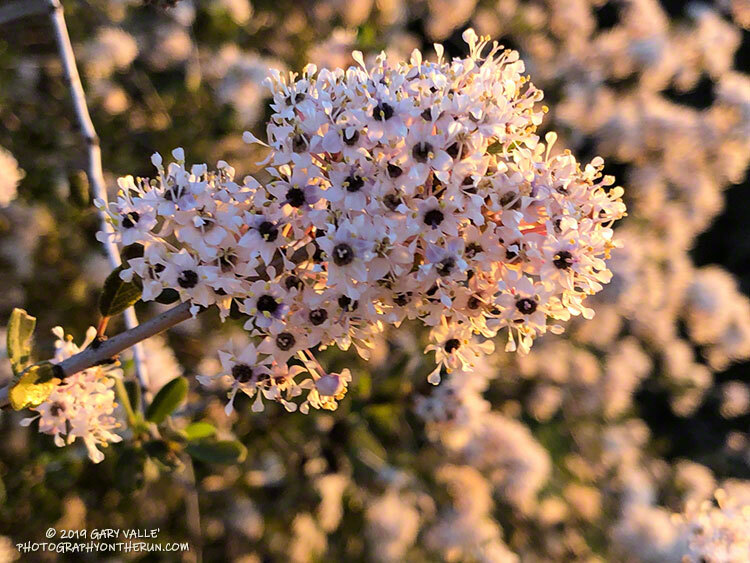 Bigpod Ceanothus is normally the first of the Ceanothus species in the Santa Monica Mountains to bloom each year. It is a foundation species in the range and can be found along most trails. These were along Fire Road 30 (Temescal Ridge Fire Road) near the beginning of a run to Trippet Ranch. In some years it seems every shrub in the chaparral is a big pod Ceanothus and the hillsides are carpeted in white. Along a trail thick with the blossoms you may notice a subtle earthy fragrance with a spicy edge. On that same trail in the Summer, you may be startled by a loud “Pop!” when a heated pod explodes, releasing its seeds. 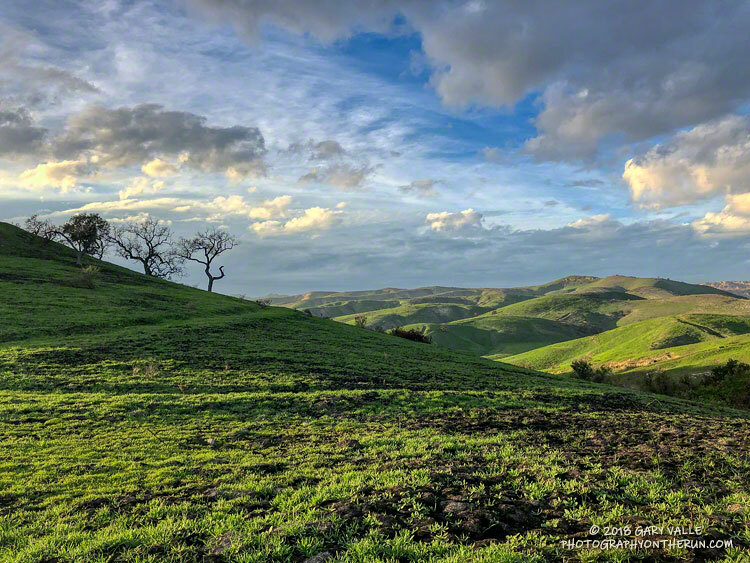 Low in the afternoon sky, the Winter sun highlights new green grass on the hills of Ahmanson Ranch following the Woolsey Fire. Ahmanson Ranch two months after the Woolsey Fire. Running along the winding course of East Las Virgenes Canyon I was both disheartened and encouraged by what I saw. Bleak, blackened slopes extended to the west and southwest as far as the eye could see. But along the canyon there were hopeful signs. The soil burn severity in the Ahmanson Ranch grasslands had generally been low. Scattered across the landscape were small shrubs and other insubstantial plants that had not burned. Some oaks still had green leaves and almost none had gray, ash-colored trunks from being severely burned. Very few trees had become fully involved. Most of the mature trees looked like they would survive. Even so, there were a number of casualties. Most of these were oaks weakened by drought and heart-rot. The rotten punk wood in the interior of the base of the tree can be ignited through an exterior weakness or indirectly by the heat of the fire. At some point the trunk of the tree is sufficiently weakened that the tree breaks in the wind or collapses. Preceding the Woolsey Fire, several drought-stressed oaks in the Ahmanson Ranch area collapsed from heart-rot. That is one of the major differences between the impacts of the 2005 Topanga Fire and the Woolsey Fire — the oaks in the Woolsey Fire were drought-stressed, and as a result of increased heart-rot, more susceptible to basal fire. Winds were also stronger in the Ahmanson area during the Woolsey Fire, which may have contributed to the number of downed trees. Out to check on some special oaks, I breathed a sigh of relief when I rounded a corner and saw the tree was still standing. A one-of-a-kind tree in the area, the 100+ year-old blue oak was singed, but had survived. On a later run, new green leaves could be seen sprouting among its brown leaves. 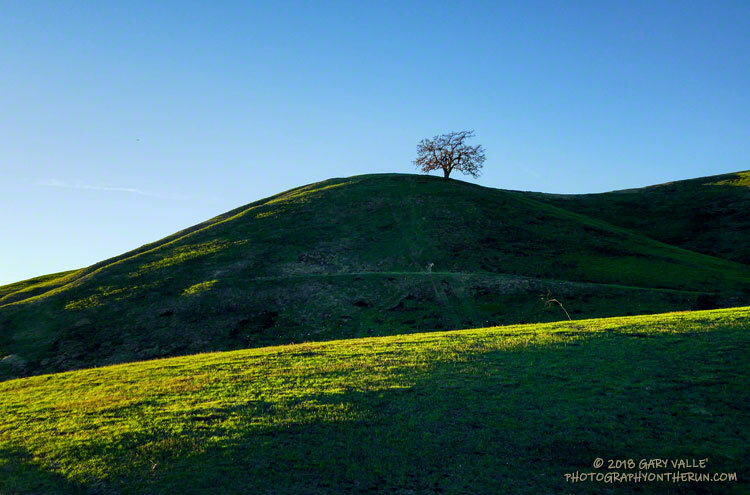 After checking the blue oak, I headed up to Lasky Mesa to check on a picturesque oak that has “starred” in photo shoots, TV commercials and other productions. This once-flourishing oak has been struggling with the drought and I had my doubts it had escaped the fire. But it did! Although it didn’t appear to be damaged by the fire, it continues to be in very poor condition. Maybe this Winter’s rain will help. It has sprouted a few new leaves, so we’ll see! The fire was astonishingly efficient at cleaning up dead trees. In some places oaks killed by the drought or the 2005 Topanga Fire were completely consumed by the fire while twiggy, dry shrubs inches away survived. One area of the Woolsey Fire that burned with higher intensity was near the Las Virgenes Canyon Road trailhead. A large, sprawling valley oak that had survived the 2005 Topanga Fire (and other fires) didn’t make it through the Woolsey Fire. Like most of the valley oaks killed in the fire, it had heart-rot and failed structurally. Following the fire, I have seen a usual assortment of wildlife in the Ahmanson Ranch area — coyote, rabbit, acorn woodpecker, towee, white-tailed kite, scrub jay, northern harrier, red tailed hawk, raven, quail, and other wildlife. A couple of sightings were unexpected. One was a small, live, Southern Pacific rattlesnake near a firebreak. The other I saw while running on the north side of Lasky Mesa on a drab, overcast day. I thought I saw a flash of blue against the deep black of the burned slopes, as the bird flittered from tree to tree. I didn’t recognize it. It was the wrong size and shape for a scrub jay, and didn’t fit the coloration or characteristics of other birds I’d seen on Lasky Mesa. When I got home, I checked the photo, enlarging it as much as I could. It turned out to be a western bluebird! That made me smile! Here are a few photos taken along the way.